My Cat Sleeps All Day and Plays All Night. Can I Change This? Ah, the life of a domestic cat: protein out of a can, mice on sticks, a grooming sesh here and there, and snoozing away 80 percent of the day. But you may have wondered before—is it normal if your cat sleeps all day? 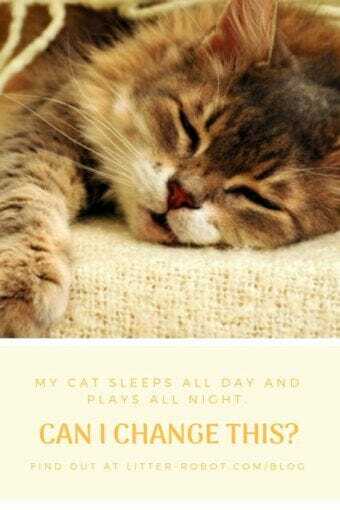 Your cat sleeps all day because she is nocturnal. If you have an outdoor cat, she is likely most active during the night. Like lions, she is a nocturnal hunter with superior low-light vision. Indoor cats also display nocturnal habits because the behavior is instinctual from their wild ancestors. Prowling the shadows all night to chase down their prey, it’s no small wonder that cats sleep on average 12-16 hours during the day! Kittens and senior cats may sleep 18 hours or more. Your cat sleeps all day because she is crepuscular. Many animal specialists say cats are actually crepuscular—or most active around dusk and dawn—rather than nocturnal. Crepuscular behavior is more attributed to house cats than strays or ferals, because house cats have learned to find a compromise between the activity around the house during daylight hours and the quiet solitude at night. This is also why your cat is more likely to beg for food around dawn and dusk. When is this not normal behavior? Can you change her routine? Maybe. So you want to get your cat on the same routine as you. Indeed, it would be nice if she stayed quietly curled up at the foot of the bed all night, instead of suddenly pouncing on your head at two in the morning. But is such a change possible? Yes, it’s difficult not to yell or even throw a pillow at your cat when she knocks over your bedside lamp in the dead of night. However, any attention you pay her will only reinforce her boisterous behavior. If necessary, confine her to another part of the house where she will eventually grow bored enough to doze off. Engage in early evening exercise. Tire her out with toys she can chase, such as wands and lasers. If she’s crepuscular, she’ll have a burst of energy in the evening anyway—you might as well use it to your advantage! After some intense playtime, she’ll naturally wind down and be ready to nap. Feed her her largest meal right before bed. Between exercise and lights out, give her her largest meal of the day. This way she won’t wake you in the night with a hungry belly. Another tip is not to feed her immediately in the morning. If she equates your rising with breakfast, she may do what she can to wake you earlier. Instead, wait a couple hours or use an automatic feeder. Give her a stimulating environment during the day. Most of us cat parents don’t have the luxury of spending all day every day at home with our furbabies. Your cat will inevitably grow bored when she has the house to herself, so be sure to provide her with enticing distractions throughout the day: cat trees and perches in the windows, puzzle feeders, and catnip toys. It’s perfectly normal if your cat sleeps all day… but reversible? Let’s just say: Good night, and good luck. Next Post 2018 Scholarship Winners Announced!